As a young child Akhenaten was raised in a traditional Ancient Egyptian manner and observed religious rituals to the god Amon. In Thebes, Amon was the god that was elevated to the highest position. In time, Akhenaten turned his focus and beliefs to another deity called Aten. (Aten is the sun god and was taken into battle with Tuthmosis IV and later taken by Akhenaten). Soon after becoming pharaoh of Egypt, Akhenaten discarded his royal name and loyalty to Amon. He turned away from old priests and began the cult of the sun disk — the Aten. Akhenaten acknowledged that Aten was the single god except Re, the sun god. He claimed he was the only person able to converse with his god. This only caused an absence of priests and he soon came to ban those that remained. He banned the worship of Amon and closed down sacred temples. Akhenaten’s wife’s name Nefertiti was also changed to “Nefer Nefru Aten” meaning “Beautiful is the Beauty of Aten.” The couple then moved out of Thebes to a new captial called Akhetaton. Everyone from the old captial moved to the new constructed captial including the court and artisans. Amarna was erected in 1353-1335 B.C. in honor of the god Aten. (Amarna is the modern name for the city called Akhetaton) It had more naturalistic styles and the art portrayed natural scenes and life-like figures. The couple raised many extraordinary buildings and conducted sophisticated ceremonies in the temples and palaces. His new captial attacked the cults of other deities in Egypt, especially Amon. Sites of Amon were desecrated and any evidence of worship to this god destroyed. Akhenaten even had his father’s cartouches destroyed because it had Amon’s name encrypted upon it. This continued to outrage the people of Egypt and left the population uneasy and angry. Most of the cities in Egypt were deprived of their estates and plantations. Corruption fell upon the temples and soon they were dependant on the city of Akhetaton. The art during the Amarna period had made a colossal change. People were portrayed as they were. Unlike most pharaohs, Akhenaten portrayed himself less god like and more human. This new style of art was portraying people in everyday lifestyles and sometimes with minute details. 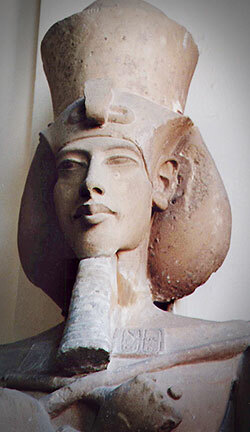 Bek was Akhenaten’s main artist during this period. The disfigured pharaoh showed an almost strange elongation of the head, large breasts, swollen stomach, and the diminutive splayed legs. He looked more feminine then masculine. Not only did Akhenaten show his naturalness but also the surroundings around him. His paintings were detailed and unique in that they showed naturalism along the Nile River. The scenes of the time period showed the river engulfed with vegetation and wild animals. Pharaohs in earlier periods showed themselves as being well proportioned and taller then their subjects. Akhenaten, on the other hand, was depicted as being at equal level with his surroundings that showed him in inappropriate scenes. Such scenes included him kissing his daughters and sitting with his wife in a family oriented manner. During the 12th year of his reign, Queen Tiy joined Akhenaten in his city. She brought with her a princess named Baketaten (Later Baketamon). Akhenaten soon provided her with housing and constructed a temple in honor of her. 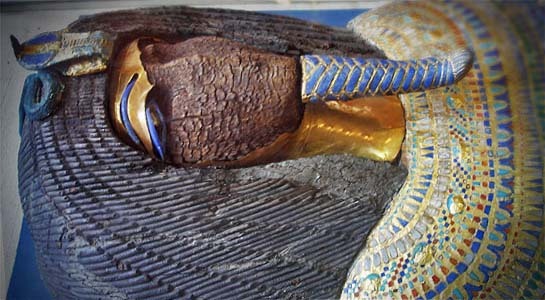 Nefertiti was no longer a favorite to Akhenaten and she soon disappears from the time period. Historians are puzzled as to why and where she left. Her daughter soon took her place and held the duties her mother once did. His daughter was then replaced with Ankhesenpaaten. He soon found anther queen who was named Kiya and might have been from the Mitanni heritage. At around the eighteenth year of his ruling Akhenaten died. Everything was destroyed and demolished soon after his death. His mummy has never been found. Everything was ravished and destroyed upon his death.